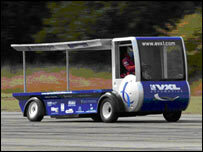 Move over Ernie - a team of engineers has delivered the title of the fastest milk float to south Wales. The £50,000 float rattled up an impressive 73.39mph as it sped past the competition and into the record books. Designed by VXL Automotive in Rogerstone, near Newport, the Electron E150 took the land speed record for an electrically-powered vehicle. In a competition held in Leicester, the float soundly beat its rival - run by Midlands team Electric Dreams - which could manage only 52mph. In comedian Benny Hill's hit song, the fastest milk cart in the west was driven by Ernie. His successor in the Electron E150 was Richard Rozhon, 32, a Formula Three racer from St Clears, west Wales, although he did not have to carry any milk on the back during the event. The 73.39mph was enough to be accepted by the Guinness Book of Records, but the float's makers believe it could go much faster. "It wasn't the speed we hoped to achieve - we hoped to achieve well in excess of 100mph, but we did well to get what we did on the day," he said. "It is nice to have brought a record back to Wales." Team leader Martin Rees praised "a marvellous team effort" for the record and thanked everyone who had given help and support. He said he hoped to see the new-look float on the streets soon. The Electron is the first in a line of new electric commercial vehicles that VXL Automotive will roll out in the coming year. Production orders are being delivered to Bridgend-based dairy Golden Vale, Cardiff's University Hospital of Wales and the new IKEA store in Cardiff. Mr Rees said the E150's batteries could be exchanged rapidly, eliminating the need to be tied to an electricity point for hours. "The success of Electron can only help to highlight the economic and environmental advantages of electric-powered commercial vehicles," said Paul Symonds, chief executive of the Symonds Hydroclean group, which runs VXL Automotive. The milk float will be on display as Newport RFC take on Pontypool on Saturday 6 September at Rodney Parade, Newport.